Adams and Cheek Dentistry in Raleigh, NC is here to talk about Xylitol! Chewing Gum is a common practice for kids and adults alike. People use it to freshen breath, diminish hunger, and as a treat. While sugar laden gums still exist, the overall trend has moved to gums made with artificial sweeteners. Today there is a new sweetener called xylitol that provides the sweet taste people love delivered in a low calorie, all natural alternative. Xylitol was approved by the Food and Drug Administration as a food additive in 1986. Today it is appearing in gum, mints, and even toothpaste! Many studies have confirmed that xylitol likely inhibits the growth of S. mutans, the oral bacteria that causes tooth decay. Chewing gum increases saliva flow, which acts as a natural dishwasher for your mouth, rinsing away food and plaque, and neutralizing the acid produced by bacteria in the mouth. Saliva also contains minerals such as calcium and phosphate which strengthen tooth enamel. Chewing sugar-free gum increases saliva flow without coating the oral cavity with harmful sugars. Sugar-free gums with xylitol have this benefit while actually decreasing decay-causing bacteria. It is also a great alternative for candy as a sweet treat for children. Trident is one of the more popular brands that offer a gum with xylitol. Spry, B-Fresh, and Xylichew are some other options that can be found easily online. 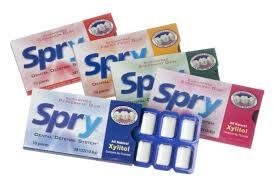 Spry is one company that offers a whole line of dental defense products made with Xylitol. Here at Adams and Cheek Dentistry we are always happy to discuss new products and answer any questions you may have. Please call our office at (919)866-1360 or click here to schedule an appointment.